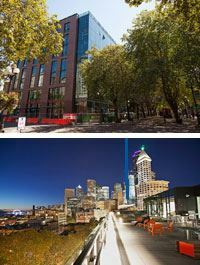 WP&BC Special Event at the New Weyerhaeuser Space in Pioneer Square! Leading employee benefits attorney Melanie Curtice has almost two decades of experience advising large public and private employers on health and welfare benefit agreements. Melanie ensures benefit plans comply with ERISA, HIPAA, the Internal Revenue Code, the ACA and other federal and state requirements to minimize the risk of agency penalties and benefit clams by participants. She also assists clients with IRS and DOL health and welfare plan audits. Mikel T. Gray leads Milliman's Northwest Health & Group Benefits practice. Mike has more than 30 years' experience in employee health and group benefits consulting. He has recently worked with large national firms to formulate a long-term plan to navigate the impact of Health Care Reform, using tactics including Private Exchanges or Full Replacement High Deductible Health Plans (HDHPs). He is also assisting clients determine how to negotiate with and create benefit offerings with Accountable Care Organizations. Happy Hour at the New Weyerhaeuser Space in Pioneer Square! Stay after the roundtable and enjoy your colleagues with some appetizers and drinks, all surrounded by beautiful views of Seattle. Online registration closes March 19. Register by phone until noon on March 20 at 206-623-8632. No refunds after March 17.